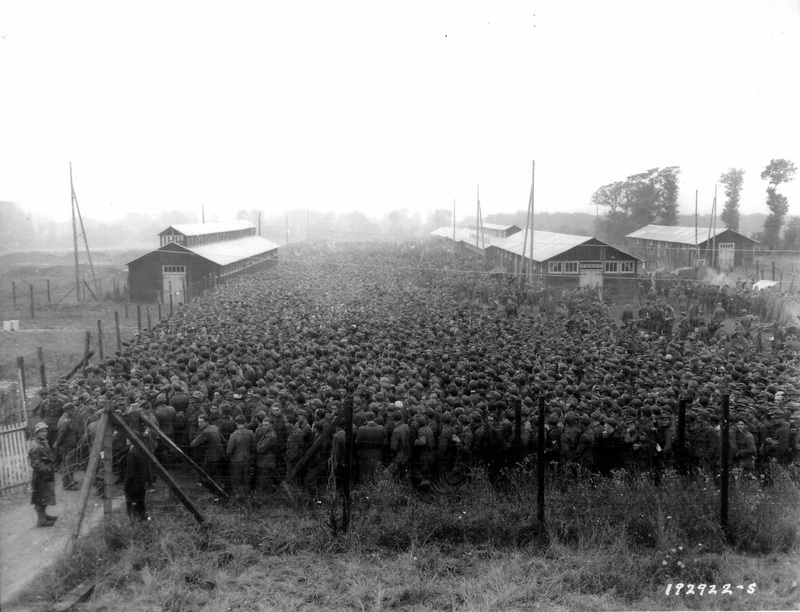 Thousands of German POW’s at Nonant le Pin POW camp after the Falaise Pocket battles in which over 30,000 Germans were captured. 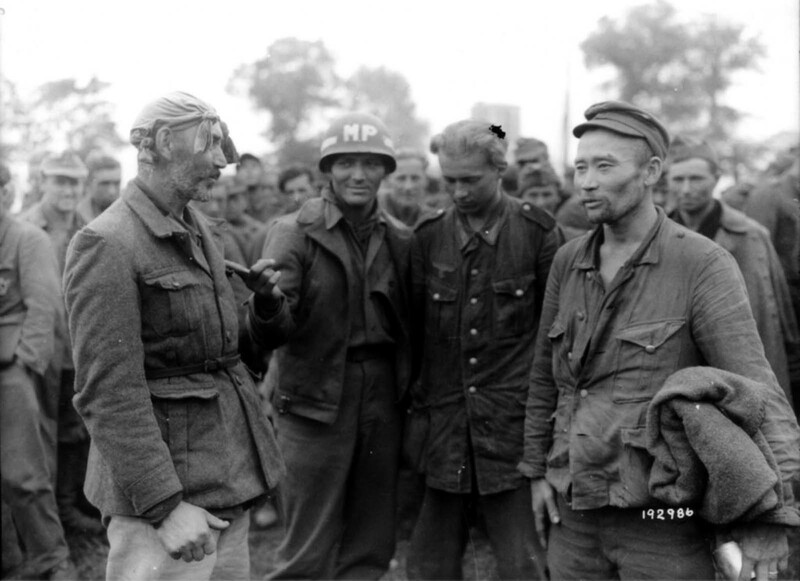 All these German prisoners of war were captured following the Falaise Pocket battle. By the evening of 21 August 1944, the pocket had been sealed, with c. 50,000 Germans trapped inside. Many Germans escaped but losses in men and equipment were huge. These photos show the human and the more realistic side of the German Army in the war. In almost all surrender/prisoner of war photographs, the German Army was in a decrepit state, overgrown hair, skinny, sleep deprived, messed up uniforms. It was not the camps that made the soldiers look tarnished, it was just a continuation of their condition when they surrendered. The guard soldiers would get in a jeep, circle around the camp, and every so often they’d yell “Halt!” and shoot their guns in the air to give the impression escaping soldiers were being shot. But the escapes were rare, none actually, because these prison camps were protecting the prisoners just as much as they were containing them. Anyone who escaped that camp would likely have been recaptured by Allied forces, or caught and executed by Resistance or Resistance-friendly citizens. Most if not all of those men knew their chances were much better inside those fences. US Military Policeman poses with “German” POW’s Nonant le Pin POW camp. Many of the “German” troops in Normandy were in fact not German but from areas of the Soviet Union which included people from the far east of that country. Often they were originally conscripted into the Soviet Army only to be captured by the Germans in the huge encirclement battles of Operation Barbarossa in 1941. Those who volunteered for service with the Germans were termed Hiwis (short for Hilfswilliger) and were typically used for non combat positions such as working in kitchens and stables. 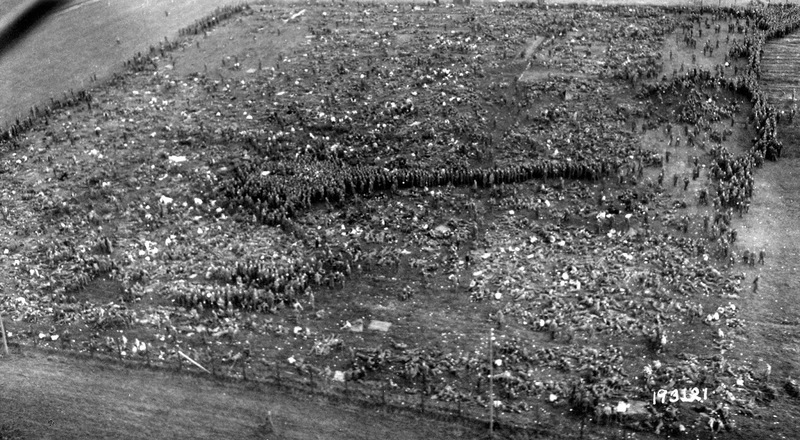 Just some of the tens of thousands of POW’s captured after the collapse of the Faliase Pocket are seen from the air Nonant le Pin POW camp. The Battle of the Falaise Pocket ended the Battle of Normandy with a decisive German defeat. Hitler’s involvement had been damaging from the first, with his insistence on hopelessly unrealistic counter-offensives, micro-management of generals, and refusal to countenance withdrawal, when his armies were threatened with annihilation. More than forty German divisions were destroyed during the Battle of Normandy. No exact figures are available but historians estimate that the battle cost the German forces c. 450,000 men, of whom 240,000 were killed or wounded. "... hunger and all sorts of diseases were rife." Yet you expect the people held in German concentration, labor, prison camps, to be in good shape at the end of the war? The German camps were organised that way. The allies had no time to set up a huge organised camp when they overtook surrendering armies. I would have thought this obvious? That is true. Dresden was the real holocaust. Civilians were literally burned alive. To this day it is taboo to even speak of anything even remotely related to Germany's history in the war or Nazi-ism. Those alive today in Europe never speak or even allude to relatives who served under Hitler out of shame. We should boldly research history and not hush it up. The silence on this issue in itself is telling. Dang. Didnt know that 2/3rds of all the Germans in the world were killed in the dresden..
".The Allies claimed that by bombing Dresden, they were disrupting important lines of communication that would have hindered the Soviet offensive. This may be true, but there is no disputing that the British incendiary attack on the night of February 13 to February 14 was conducted also, if not primarily, for the purpose of terrorizing the German population and forcing an early surrender. It should be noted that Germany, unlike Japan later in the year, did not surrender until nearly the last possible moment, when its capital had fallen and Hitler was dead. Because there were an unknown number of refugees in Dresden at the time of the Allied attack, it is impossible to know exactly how many civilians perished. After the war, investigators from various countries, and with varying political motives, calculated the number of civilians killed to be as little as 8,000 to more than 200,000. Estimates today range from 35,000 to 135,000. Looking at photographs of Dresden after the attack, in which the few buildings still standing are completely gutted, it seems improbable that only 35,000 of the million or so people in Dresden at the time were killed. Cellars and other shelters would have been meager protection against a firestorm that blew poisonous air heated to hundreds of degrees Fahrenheit across the city at hurricane-like speeds." Even if it killed every person in Dresden, that would only be one third of Jews murdered. I would rather have a bomb drop on me than have experimental operations with no anesthesia. You should probably do a bit more research. The actual death toll, according to the Nazis, was 35,000. Goebbels personally added the "1" in front of that number for propaganda purposes. It's all a matter of public record, and can be easily researched by looking up the various sources. Please explain what the real genocide was on Germany ,compared to the genocide on Jews,Gypsy's and other races who suffered under the Nice Nazis!! I am for sure reading the wrong history book. Why were there inmates in Bergen-Belsen still alive in March 1945 when it was liberated, if the Germans were so intent on killing them? Shouldn't the Germans have gassed them on arrival? (apart from the fact that there were no gas chambers there, although at the time it was claimed that there was) A lot of inmates however were in a terrible state, and were dying from starvation and typhus and continued to die in spite of efforts of the British to help them. Most of the deaths at Belsen occurred in the final months and just after the war, because supplies were totally disrupted as a result of indiscriminate bombing by the USAAF and RAF. Germany was in a complete state of collapse. Prior to that, conditions in the camp were reasonable. I was eight years old when the war ended and I believed that the Germans had done this deliberately because that is what we were told, and so on right up to today. The emphasis was always on the emotional aspect which tended to swamp any application of logic to this event. The same applies to the other camps as well. Eventually one noticed the stories did not line up with some of the facts and doubts began to emerge. Then the internet came along and blew the lid off by giving access to previously known but suppressed facts about WW2. For those who have not given much thought to these 'Holocaust' claims and simply believe what they have been told repeatedly it will be difficult to cast out this ingrained belief. They need to ignore the barrage of TV propaganda for a while and look at some of the internet sites with a critical eye. The 'Holocaust' story has so many contradictions and story-line changes as well as outrageously ridiculous claims by some “survivors” that it has lost all credibility. They say that "history is written by the victors", which means that the version of the war in the history books is biased to the story the victors want told. Unfortunately we have been so brainwashed by this tainted version of history that it would take courageous people to research, find the truth and then publish it. This idea that the war was Good vs Evil is simply an ongoing narrative of the propaganda of the victors. If the other side had won, we would still have the same narrative, but simply the sides would be opposite. This is a truth that has been shown down the ages, even in cultures like Ancient Egypt, where the depictions of battle carved in stone are biased stories and not the truth of the event. Jay and Charles, you are joking right? I mean seriously, you cannot actually believe what you both have written? The terrible and sad fact is that they actually do. Some buffoon probably did the holocaust denial jig with them, and they, fools and morons that they are, bought into the lies. My uncle was THERE, with the 3rd Army. He knew what the war was about. And these lying fools besmirch the sacrifices of the millions of French, British, US, Russian and dozens of other nationalities that fought against the Nazi disease. I see everyone arguing about which side "really" committed the war crimes. Can either side give us a good reason for any country to decide it wants to kill thousands and thousands of fellow human beings? WAR is a CRIME. PERIOD. The only time any country would be justified in declaring war would be in defense of it's borders. That it could not be helped is a lie. It was done intentionally. The allies killed over a million pows in the rhine meadow camps. 35.000 killed in Dresden?? Youre kidding right? Dresden had no anti aircraft or warning systems. The town was also flooded with refugees.